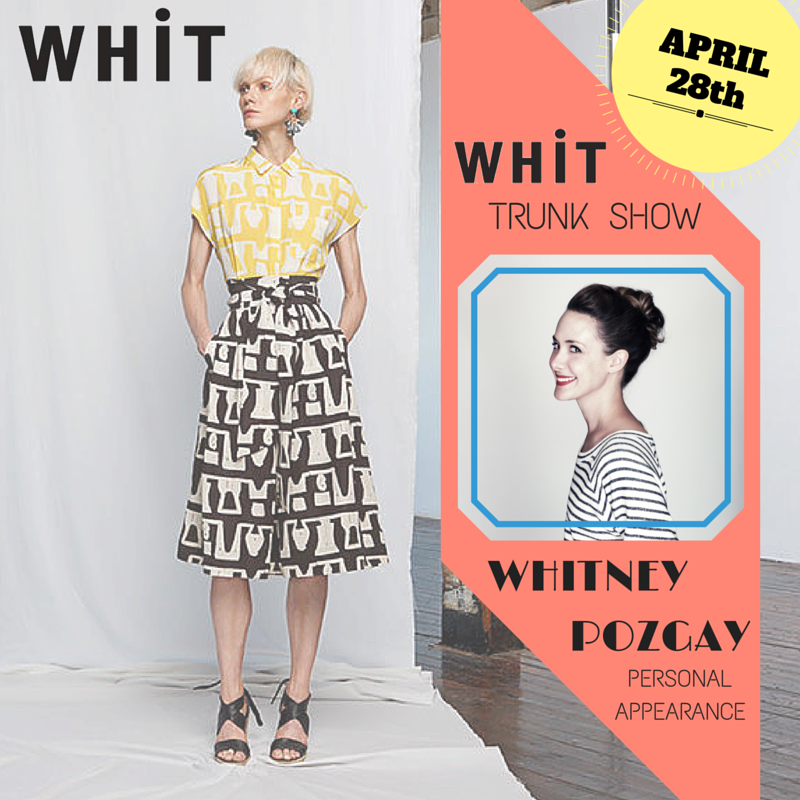 Want to get to know Whitney Pozgay of WHIT a little bit better before meeting her in person at tomorrow's Wrabyn trunk show event?? Then look no further than at this little Q&A I was lucky enough to do with her. 1. Why did you want to become a fashion designer? I went to the University of Texas at Austin to study acting and costume design. As much as I loved that, I liked the idea of designing something for the real world that would have its own story way more. Fashion is open to interpretation by the customer. One of my favorite things is to see something I have designed being worn in a way I hadn't even thought of. 2. What's the best part about being a fashion designer? I love collaborating with other creative thinkers...designers, artists, songwriters, etc...I learn a great deal from them and they influence my work in unique ways. 3. If you could describe your brand in one word, what would it be? 4. Where do you find inspiration for your collections? My husband and I very often look to art, but I find inspiration everywhere. Architecture, nature, music, travel, movies, and vintage references always find their way into my collections as well. 5. What's the most exciting part about being a fashion designer? I love storytelling with a collection. It's not just about each item, but also about building a cohesive idea. 6. Are there any trends out there that you're loving at the moment? I am still liking the off-the-shoulder trend. It is flattering, romantic and fun at the same time. I am also a big fan of bright colors and love that so many people have been embracing them in saturated hues this season. 7. Any trends or styles that you steer clear of? 8. If you weren't a fashion designer, what would you be doing? There are so many things I would like to do. I think I would have eventually started a shop of some sort. I would love to open a home/flower/candy store some day. 9. I can only imagine how stressful being a successful designer is, how do you unwind? I try to spend as much time outside as possible. The city can feel a little congested sometimes, so fresh air is important and I love a picnic in the park. My husband and I also try to go to museums and galleries as often as possible for fresh inspiration and to decompress. And a few of the pieces you'll be seeing tomorrow!